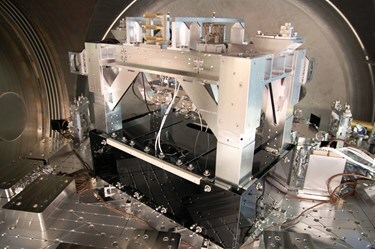 Precision Glass & Optics (PG&O - www.pgo.com) announces the successful collaboration with the team at the Laser Interferometric Gravitational Wave Observatory (LIGO - http://www.ligo.org/science/GW-Detecting.php) to develop and install specialty black glass plates that will be used to reduce noise, or unwanted electronic signals, in the observatory detectors. The two large interferometers, collectively called LIGO, are located in Hanford, Washington and Livingston, Louisiana. They are dedicated to the detection and measurement of cosmic gravitational waves for scientific research. PG&O was selected to manufacture four sets of 26 unique, black glass optical panels for LIGO. Each piece was scribed and then machined on a waterjet to a tolerance of ±0.010. Each part was subsequently laser engraved with the part number and serial number. The panels were thoroughly inspected for both visual and dimensional specifications before being meticulously cleaned before the coating process. To filter out excess noise, the parts were then coated with a thin-film broadband, anti-reflection, also called a BBAR coating (R<0.5% at 1064 nm, with an angle of incidence at 0°). LIGO’s output mode cleaner (OMC), where the specialty black glass from PG&O is installed, is intended to filter out light that does not potentially carry a gravitational wave signal. For more information about PG&O’s precision glass, optics, and specialized optical coatings, please go to: www.pgo.com. PRECISION GLASS & OPTICS (PG&O) – www.pgo.com – Celebrating the company’s 30th year, PG&O delivers high quality, precision glass, optics, and optical coatings for a variety of applications. The company has an extremely large inventory of glass products and a full optical fabrication shop to provide advanced optical coatings and manufacturing large mirror blanks. Other services include CNC machining, polishing, slicing, sawing, scribing, grinding, edging, assembly, and more. With three large coating chambers, and an expert, in-house engineering staff, our cost-effective and reliable optics and advanced thin film coatings are ideal for military, aerospace, astronomy, biomedical, imaging, laser, digital cinema, solar markets, and more. LASER INTERFEROMETRIC GRAVITATIONAL WAVE OBSERVATORY (LIGO) www.ligo.org is funded by the National Science Foundation (NSF), designed and constructed by a team of scientists from California Institute of Technology (Caltech), the Massachusetts Institute of Technology (MIT), and industrial contractors. For more information on the LIGO project, please visit: http://www.ligo.org/science/overview.php.